Hi, everyone! Today I'm bringing you some simple and easy nail art! What I love about this design is that it doesn't require any form of precision. All you need is a base color and a flaky top coat. Remember all of those 24k gold flake top coats that were out there? How about the translucent flakies? Well, here's your chance to break them out again! 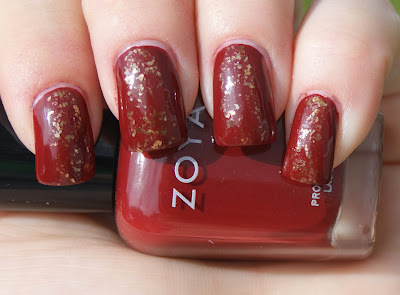 For this manicure, I used Zoya Pepper (from the Cashmere Collection) with Zoya Maria Luisa (from the Satin Collection). I had been wearing Pepper for a few days by this point and wanted to freshen up my look. So I painted a single stripe of Maria Luise right down the middle. The great thing about flakies is that there is no need to be perfect. They cover up the mistakes because of their sparseness. So for all of you ladies looking to spruce up your manis this coming weekend, break out your flakies and get ready to race!